With the help of various tests in the field of alternative medicine the attempt was made to elucidate this ancient riddle. For centuries mankind has drawn strength from prayers and mantras, used talismans and holy signs or specific magic words – for good purposes but sometimes also for bad ones. The names of gods, guardians, angles and certain spiritual beings are said to be effective in themselves. Esoteric books on the “cosmic ordering-service” and the American “positive thinking” have made ancient forms of religious requests and prayers popular again. “Modern forms” of different magic words can be found in advertising today. Products receive catchy names and smart, short slogans, which together with emotionally strong images and repetitious TV commercials, are strongly impressed upon our memory. Surely everyone has experienced a slogan coming to mind quickly when seeing a certain product on the shelf of a store. But can the influence of ancient and new “magic” words and symbols be measured and proven or is it negligible and minor? Six years ago, the images of water crystallization of the Japanese Dr. Masaru Emoto caused a sensation in Japan and, in the following years, also in Europe. They demonstrated that water can form different crystals during freezing, depending on a spoken word. Positive terms such as “love” lead to a more structured crystal than negative terms such as “demon”. Similar changes were also observed with different harmonious or disharmonious pieces of music. The power of the word has been known from alternative medical research in Kinesiology. It was discovered that the human organism positively reacts to words such as “love” in the muscle test. In speaking a negative word such as “hatred”, the candidate weakens his energy system. And it should be pointed out that expressing or thinking a word has this effect, the candidates did not have to try to fit the term emotionally. For it has been demonstrated by research from the Californian “Institute of HeartMath“ that in fact emotions vehemently change the organism. 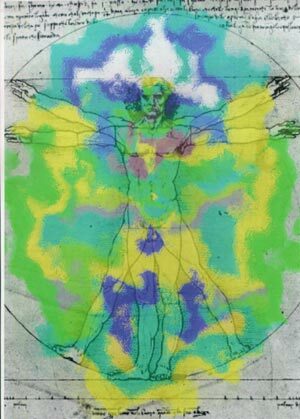 There the scientists stated that praise, recognition, and love measurably harmonize the heart beat, strengthen the vegetative nerve system and the immune system, support thinking and the ability to concentrate and harmonize the entire human being. The same thing happens if the positive emotion is only remembered or recalled. A word of recognition and a short beautiful day dream, e.g. of a nice holiday at the beach, are pure medicine. All this shows the positive effects of auto-suggestion and how important thoughts and words are for ones own health. But are words effective as well, if they are not spoken aloud, thought or heard? Is there an autonomous “magic” effect of holy names and words? This question was addressed at the LIFE-TESTinstitut. Dr. Manfred Doepp, a member of the board at the Gesellschaft für Energetische und Informationsmedizin, and Rainer Lüdtke, who works at the Institut für Medizinische Informationsverarbeitung der Universität Tübingen, have successfully carried out preliminary tests related to this question.1 The results of the tests were very amazing for all participants. In double-blind tests English and German words were written on slips of paper, which were folded and mixed. The candidates took the slips into their hands without reading, and at the same time the values of the meridian energies were measured with the help of a medicinal apparatus. While measuring, neither the candidates nor the persons carrying out the test knew which word was written on the slip of paper. Only at the end of all measurements were they opened. The result was spectacular. Indeed, some words significantly changed the human energetic level, they increased or decreased the life energy of the person – bear in mind, without being read! The most significant results were observed with the words “god”, “love”, “guilt” and “sin” and in German “Liebe”, “Friede“ and “Hass“. In German the word “Liebe” (love) has the most positive effect. “Friede” (peace) is slightly negative and “Hass” (hatred) is distinctly negative. In English the word “God” has a very strong effect and “love” is very positive, but the words “sin” and “guilt” were distinctly negative. Thereafter the tests were repeated, and the words were read silently. Here as well the measurements turned out to show a similar tendency. Related to the same words the reaction was also positive and negative. It was amazing that the reactions were more distinct in the previous double blind test by “feeling” – the word “love” was unconsciously felt even more positive and “hatred” more negative. A word in the own mother tongue shows a stronger energetic effect than the same word in a foreign language. Thus the energetic effect of the word depends on the understanding during the “reading”, amazingly in the previous feeling test as well. Persons who do not understand English do not react to the English word either – neither when reading nor feeling. Only if a completely unknown word is hidden in a nice advertisement or in a mystical ambience, do we react to it again! Thus an “effecting word” obviously needs a cultural and emotional background that is known to the test person. Is there somewhere deep in ourselves the knowledge about the word and does a yet unknown inner authority of consciousness recognize the word only by “feeling”, then this word does have an effect on us – even without reading it. These sensational results of the tests should make us more sensitive for a more conscious and careful use of words. The humorous advice to sleep with a book under the pillow in order to gather the contents may not really be helpful. But the single word “love” written on a slip of paper can support our well-being “in a magic way”. The secret influence of some words and the way their effect is transmitted to us is already mysterious enough, but then the magic effect of symbols and signs is even stronger. There have been some tests over and over again, aimed at examining the effect of a symbol by measurement methods. The most widely known tests are from Prof. S. Callahan and the esoterically interested scientist Dr. Patrick Flanagan, an alternative water scientist and inventor of the “neurophon” with the holy Indian symbol of Sri Yantra.2 They discovered that the geometric form of the Sri Yantra is able to direct infrared light coherently in the same way as a laser. The infrared waves oscillate in the same pulse and go further and deeper into substances. This is a highly amazing effect from a symbol. Indeed, the scientists were not able to grasp its spiritual effect in this way. According to Indian teachings of wisdom, similar to the original sound “OM”, “Sri Yantra” symbolises the holy sound of “OM” and reveals in its geometry the universal knowledge of the creation. For millenniums the symbol of Sri Yantra has been used as an aid for centering the mind and for the harmonization of places energetically. Thanks to scientific tests it was confirmed now that in fact the Sri Yantra does effect the arrangement of at least certain light waves. An important hint of the general function of symbols was discovered: they organize the “chaotic surroundings” in a typical way and thus cause a subtle effect. With the help of standardized tests with a pendulum the radiologist Hartwig Fritze examined the effect of symbols3 – of ancient holy signs as well as modern company logos (which sometimes resemble old symbols amazingly). His tests with various symbols with a size of 5 cm, showed a clear difference of the intensity of their radiance. For instance, the energetic power of a roman cross is perceivable per pendulum up to a distance of 1.5 m. The cross (in form of an “Y”, similar to the ancient „Man“-rune) is still perceivable at a distance of 2.2 m and the Christogramm even at a distance of 3.2 m; the sign OM shows a radiance of 3.6 m and the Egyptian Eye of Horus even radiates in a distance of 7.2 m.
But also company logos have such effects. According to Fritze e. g. the sign of Mercedes is perceivable up to a distance of 1.8 m and the Shell (of Jacob) of the petrol Shell company up to 1.7 m – they rank only little behind the force fields of holy symbols. This means, even though one does not suppose that nowadays symbols and signs generally are effective next to being optically pleasant, they do have an influence on our energetic system. And this is all the more true when it concerns symbols we wear directly on our body, like for instance the logos of name brand clothes. Thus, when buying clothes we should not only be aware of how the garment fits, but should also find out if we really feel well in it. In the old alphabets of the world such as the runic writing, Sanskrit and the hieroglyphs, even single letters themselves have an amazing effect. The Odil rune e. g. radiates up to 2.8 m, the Nyd rune up to 2.1 m; the As rune 1.6 m and the Fe rune 1.5 m. Fritze also tested how the candidates energetically reacted to the “magic power of letters” – and whether the intensity of energy fields itself or also an associated quality of effect is relevant. Whereas the energetic powerful Odil rune only showed a positive effect for one out of ten candidates, the rather weak Fe rune was beneficial for no one, the influence of the As und the Nyd rune were positive for all. Contrary to the previous described effect of the words in the test, with these forces of symbol it was not necessary that the candidates understood the ancient meaning of the letter symbols. The following tests of different symbols at the LIFE-TESTinstitut show that the “magic” use of symbols is effective in a more universal way than the use of holy names and word formulas. With the help of alternative medicinal diagnostic devices measurements of meridian energies were carried out with the Prognos device and the segmentary diagnostic (Segmentardiagnostik) per “Amsat device” as a double-blind test. The geometric symbol “Flower of Life”, the Xiom amulet and the symbols of the new energy jewels “Signs of Colour” were tested in their effect on persons, without the candidates being able to see the symbols. 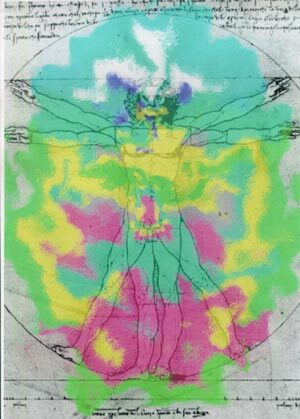 The measurements showed that the geometric form of the “Flower of Life” (which is a well known energy symbol that can be found in all cultures of the earth), have a balancing effect on meridian energies; the candidates were harmonized (20 % showed a neutral effect). On the other hand, the Xiom amulet, originally found in Egypt, increased the energetic level and at the same time had a relaxing and mentally stimulating effect, measured by the increase of Delta and Theta waves in the brain (with a neutral effect in 40 %). 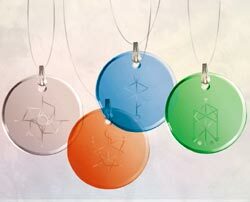 The four different glass amulets “Signs of Colour” with different energy symbols also had different effects. The symbols are superimposed letters of runic writing. In the tests the energy flow of the candidates was influenced in a positive way by the aqua blue (called “harmony”) and the “crystal”-transparent amulet (called “protection”) and for the rest of 20 % the effect was neutral. Neither of the candidates showed a negative reaction. 60 % of the candidates reacted positively to the orange coloured and green amulet (themes “love” and “transformation”). 40 % of the candidates showed a decrease of the energy level.4 Each candidate reacted positively to at least one of the theme related symbols, and one was clearly rejected –in individual combinations. With these tests of amulets and signs it is clear that symbols can have an amazing energetic effect. But the real influence in quality and the spiritual dimension of symbols and signs can only be determined to a small degree with present-day measuring methods. If a symbol is really beneficial for a person, should therefore be felt by the own inner attentiveness or perhaps with the help of kinesiological muscle tests – but not only in regard to amulets, which we consciously choose, but also to other logos and symbols of companies, by which we are surrounded daily. Wirkunk des Symbol-Schmucks "Signs of Colour" in der Biopulsar-Messung: Im Bild links zeigen graue Farbflächen starke Energiemängel und –blockaden in Bereich der Aura von Brust und Becken an, weiß-blaue Flächen weisen auf leichtere Stauungen hin. Als harmonisch gelten in diesen Energiebildern grüne Farben, insbesondere Türkisgrün.